It's time to review one of the most popular Nixie kits around. The Spectrum from PV Electronics is one of the standards of Nixie Kit builders since it was launched. It supports large tubes, and in this review we're using IN-18 tubes, which are still quite easily available, but which are starting to reach quite high prices. Expect to pay around $50 per tube for them, so that means a clock with IN-18 tubes will set you back around $400 before you have a case. I paid around £85 for the kit, so that's a bit over $100 dollars at the current exchange rate. Cases are available, but I didn't get one. I probably still will, but that's a thing for another day. I have never looked at the Spectrum 18 before getting the kit to review it. I was aware that it is large format tube clock, the PCB measures 280mm x 80mm, but had not looked at the circuitry in detail. The package arrived quickly, but slightly damaged. Fortunately, the contents of the package was not affected by the damage to the packaging. The PCB appears to be of high quality, with gold-plated pads and matt back solder mask. Before starting, I did a quick check I found several problems. Contacted Pete and told him about this, and he immediately replaced the PCB free of charge, and no questions asked. That's service! The build manual is excellent, with plenty of clear illustrations and explanations. It is clearly laid out and takes you step by step through the build. I intend to more or less blindly follow the manual for this build. Scanning what there is to be done, it does not seem a challenging kit at all. All the tricky parts seem to have been dealt with (for example, the high voltage power supply comes already assembled). Things like pull up resistors for the back light LEDs are supplied as 9-pin SIL resistor network arrays, so also they are easy to install. With this review, I'll also take you through a couple of "gotchas" that you should avoid doing. I'm building it so that you can learn from my mistakes. Talking to Pete about the design decisions he made assures me that this is a clock intended for a long life. First of all, the tubes are already long-life doped tubes, secondly, the IN-18 tube seems to appreciate being used in a "direct-drive" clock. This means that the tubes are not rapidly multiplexed (switched on and off), and instead each digit element is supplied with a constant voltage, but at a lower current. Multiplexed clocks, although simpler, drive one tube at a time, and to achieve the brightness, each tube must be supplied with more instantaneous current. The average current remains the same, but the dreaded blue dot can appear in cases where the drive current is not exactly right. Also the fact that tubes are socketed shows that this is a maintainable, high quality clock. One word of warning here though: Even if the tubes are socketed, refrain as much as possible from plugging and unplugging the tubes: the tubes are fragile, and the strain put on the pins during insertion and removal can cause out-gassing, which means the end of the tube. You should unplug and replug tubes only for valid reasons, such as replacing a damaged tube for good. The High Voltage generator board is a separate board for the simple reason that if any part of the electronics needs replacing, it will be this part. The high voltage generator circuit gets hot and each time there is heat, the life of an electronic component is reduced. The rest of the circuitry is not under strain at all, and can be expected to last indefinitely. Having said this, even the HV board almost never fails, but if it does, it is a 2 minute job to change it. The tube holders are acrylic mounting boards which diffuse the light of the RGB LED underneath the tube and also serve to hold the pins in place. Taking the covering off the acrylic can be a bit tricky, but rubbing the foil hard with a thumb can cause it to release easily. There is only one thing you have to be careful about with the tube holders, and that is to make sure you insert the pins from the right side and with the pin jaws pushed into the acrylic first. Some of the holes are too big to take the pins, and this is intended. Not all of the pins on the IN-18 need to be used, and the larger holes are to remind you that the pin does not need to go in that hole. Next you have to put the resistor networks onto the board. Make sure you do this from the bottom side of the board! If you do it from the top side of the board, the resistor network packages foul the tube holders and it gives an ugly result. In general, look for the silk screen marking that should guide you which side to mount components from. In this case, the silk screen rectangle is on the bottom side of the board. The long SIL (Single In Line) packages for the resistor networks are not polarised, so you can put them in either way round. The only modification is that the input and output smoothing capacitors have slightly different values, and the Schottky diode is a generic 1N5819 instead of the 1N5822. The capacitors and the regulator are laid down to reduce the profile of the board. You have to be careful to mount the capacitors with the correct polarity: make sure that the white stripe on the capacitor matches the markings on the board. The inductance and the socket are mounted on the bottom of the board. Testing the low voltage circuit is easy. Power on the board, by connecting the power and check that nothing gets hot. After a few seconds if nothing gets hot, you can test the voltage at the test points on the top of the board. The test points are conveniently located on the top of the board, and are clearly marked. The high voltage supply is usually the hardest part of a clock to build, but PV Electronics has taken a good route for the Spectrum: Instead of having individual components on the board to make the high voltage generator, the high voltage is generated by a pre-built and tested module. From one point of view, I think this is a clever move. If any part of the clock is going to wear out, it is going to be the high voltage generator: it gets hot and does a tough task, and for sure doing it this way means that there are less support calls. On the other hand I feel that part of the fun has been taken away. I'm sure it is not the general feeling that people will have. The high voltage generation is therefore much easier to build than on a traditional clock. It only takes a few minutes, and if I understand the circuit correctly, the controller only needs to be installed to turn the generator on via he module's "enable" line. The tube drive circuit is made up of two HV5622 specialised controller ICs, which are purpose designed for driving high voltage circuits. 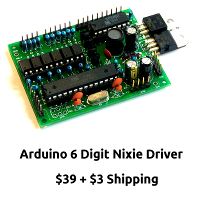 The are 32 bit shift registers, with 32 output drivers capable of easily driving Nixies. They are quite easy to control, and in total there are 64 outputs. These are arranged as 6 x 10 outputs (for the tube cathodes) plus 2 x 2 further high voltage drivers for the separator neons. The HV5622 appears to be running out of specification: The data sheet says that the supply voltage should be 10.8V - 13.2V, of course meaning that 12V is the ideal voltage, but in the Spectrum, it is being run at 5V. This rather neatly gets around a interfacing problem with the logic levels that the PIC controller can supply. If you had the HV5622 running from 12V, normally the defined logic levels should be that LOW is less than 2V, and HIGH is greater than 10V (which is vcc - 2V). Running the 5622 out of spec, makes the login interfacing easy, but it is outppf spec. I suppose here that he PIC can't drive the 5622 at anything near the 8MHz data rate, and this makes the combination reliable at 5V. The only other point to note is that the sockets for the PLCC packages have to be put in the right way round, with the notch on the socket matching the notch marked on the silk screen. Get this wrong and you will suffer a lot. The PIC controller has a great feature that Atmel controllers don't: they have an on-board Real Time Clock circuit (RTC) which only needs an external 32.768kHz crystal to make it work. The controller processor clock is then derived from this using a PLL. This part of the circuit is really easy. While I like the idea of having the IN-18 tubes socketed (there is really no alternative), I'm not a huge fan of the sockets on the Spectrum 18. I had to fiddle about with them for a long time, and to my (rather conservative) tastes, they grip the pins on the tubes a bit too well. I know that a good connection is important, but these fragile old tubes don't like to be forced to do anything. They might not fail right away, but I always get the feeling that it is so easy to damage the tubes in the process of forcing them into the sockets. I do see the need to have the acrylic holders, so that the pins don't get out of alignment, but I get the feeling that they constrict the pins a bit, meaning that excessive force might be necessary. I have no proof for this assertion, it's just a feeling I get. These two sections of the manual deal with filling in some of the discrete components that are used in the clock. R8 - R11 are ballast resistors used on the neon indicators. R12 - R14 are current limiting resistors for the LED indicators, R17 - R19 are used for the speaker. R16 is a pull up resistor for the temperature sensor and R20 appears to be a total waste of time. The drivers are the Q1, which is an MPSA42, which drives the speaker. This is a high voltage transistor, but I suppose it was chosen because it can withstand the voltages used in Nixie tubes, and the MPSA42 is being used here as a jelly-bean NPN transistor. Q2 - Q4 are used to drive the three channels of the RGB backlights. C5 and C6 are a super capacitor and a decoupling capacitor, as well as a header to allow the board to be quickly reset. This circuit allows the clock to keep running which the power is turned off for a limited period of time. This means that the clock does not immediately forget the time. This section of the manual deals with installing the LEDs (D4 to indicate if the alarm is active, D5 to indicate if GPS module is active, D6 to indicate that Daylight Savings Time is on), the switches and the connectors the for external PIR and GPS/DCF module). I decided to install the LEDs standing upright, because I didn't want them protruding over the edge of the board, btu then found out that the switches protrude anyway. Depending on the sort of case you install, you might need to install some of these components on the botton of the board, so read the manual carefully! Well, that didn't take long! The buzzer is installed on the bottom of the board. I can't really find anything else to say about it. Up until now, the clock has seemed to be a really well-designed and thought out kit, but this step feels a bit "how you doing" in comparison. The installation of the RGB LEDs is fiddly, hard to get right, and unnecessarily troublesome. The bending of the leads is a bit approximate, and you need to pay good attention to the orientation of the LED when you start bending the leads. In my kit, I had a spare RGB LED, and I suppose that this is because lots of people get at least one wrong. If you don't pay good attention to the way up you hold the LED when you start bending, it comes out with the common lead in the wrong position. Take good care! Soldering the LEDs is also a bit awkward. The leads to be trimmed are difficult to trim, even wth tiny side cutters. In the end, soldering the LEDs happened without any great mishaps, but I would have hoped for a better solution than what was offered. This is a fiddly task, and while going through it, I found that the manual is wrong. It says to cut the heat shrink sleeving for the neons with the long legs to 45mm, but that is too long for the glass tubes that are supplied. Instead I cut them to 40mm and that turned out just perfect. I also shrank the heat shrink sleeving before the final soldering, so that the heat of the soldering would not cause the extensions to drop off. After installing the separators, I gave the clock a quick test. My tubes have cathode poisoning, and I'll show you in a later article how to deal with that, and also give the clock a full user review. I'm totally satisfied with the resulting clock. The Spectrum 18 kit is easy to build, and works well. The instructions are clear where they need to be, and short enough when there is no need for additional explanation. There are no complicated components to deal with, and as an overall impression, the kit is well worth the money. It has a good set of features, and is well thought through. There are a few parts of the construction that don't match the overall quality of the rest of the kit. The tube holders don't fill me with confidence, and I feel that they are a bit brutal with the delicate and expensive IN-18 tubes. The mounting of the RGB LEDs feels a bit improvised, and a jig or on board LEDs might be a great addition to the kit. The leg extensions on the neons is a bit fiddly, and seems also a bit improvised. However, these are minor niggles, and on the whole, the kit is excellent! I would recommend it to anyone wanting a large tube clock.